1. It takes approximately 8 years for termites to rear their ugly heads. 2. Even if you’re buying new construction, it’s possible to have termites. They have no problem taking residence in wood at the lumberyard. 3. 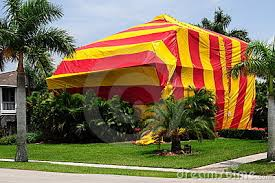 If there is serious infestation, you will need to fumigate your home to rid yourself of termites. 4. 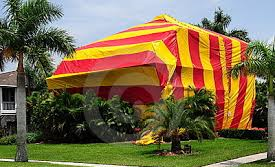 Most termite companies outsource their tenting which results in a marked up price for the homeowner. There are companies who do the tenting in-house which will save you money so don’t be afraid to ask! 5. There are non-toxic treatments but at the end of the day if you have a full infestation, fumigation will most likely be the only way to get rid of the little buggers. The company will still recommend fumigation as the number one treatment, and the non-toxic alternative will only be a secondary treatment without the same warranties most likely. 6. How termite treatments are being negotiated in a real estate purchase contract has recently changed in southern California. Just about two years ago, buyers would ask sellers to handle Section 1 termite items in the offer before there was even a termite report on hand. But now, termite work has been grouped with all other possible repairs. Buyers typically negotiate termite repairs at the same time they are requesting other repairs based on the home and other inspections. What this has successfully done is take termite treatments off the lenders’ radar. And now the lender doesn’t have to require fumigation prior to funding, and the seller won’t be forced to move out early or leave for 3-4 days during tenting and then return to move out again. Have more questions regarding termites, tenting, and negotiating them in a real estate transaction, feel free to contact me! ← Previous Previous post: How’s the (Real Estate) Market?